In the last week of November 2018 two delegations of German university representatives visited Accra at the same time. The DAAD’s EU section (anchor) brought in over 20 German university representatives and Baden-Württemberg International, the internationalisation agency of one of Germany's biggest federal state, travelled to different cities in Ghana with a Higher Education delegation. 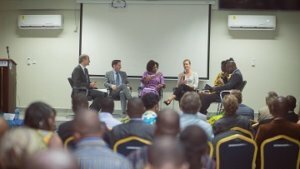 The Information in Accra seized this chance to organise a panel discussion and networking event to get the German representatives in touch with potential Ghanaian partners for cooperation projects. Hosted by Francis Dodoo, the University of Ghana’s Pro-VC for Research, Innovation and Development, experts from Germany and Ghana joined the panel to discuss their motivations for and previous experiences with international cooperations and discuss the potential impact on society. After a networking lunch, all participants had the opportunity to visit different selected units of the University of Ghana to learn more about specific aspects of internationalisation and engage in smaller group discussions. As more and more German institutions develop a keen interest in partnering up with Ghanaian universities, facilitating the building of new networks remains one of the DAAD’s aims.